Grumbacher Max Oil Painting Mediums are two completely non-toxic formulas that can be freely used with Max paints without concern about proportions. Each enhances the water miscibility of Max or mixtures of Max with conventional oils. They are compatible with conventional oils but will not make them water miscible. 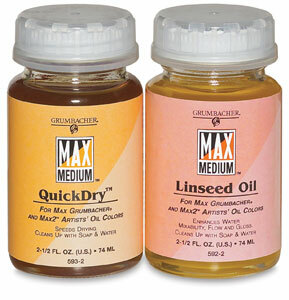 Linseed Oil Medium — Finest artist's linseed oil modified to be completely miscible with water. It improves flow, and increases gloss. 2.5 oz (74 ml). Quickdry Medium — Speeds drying, improves flow, and increases gloss. 2.5 oz (74 ml). 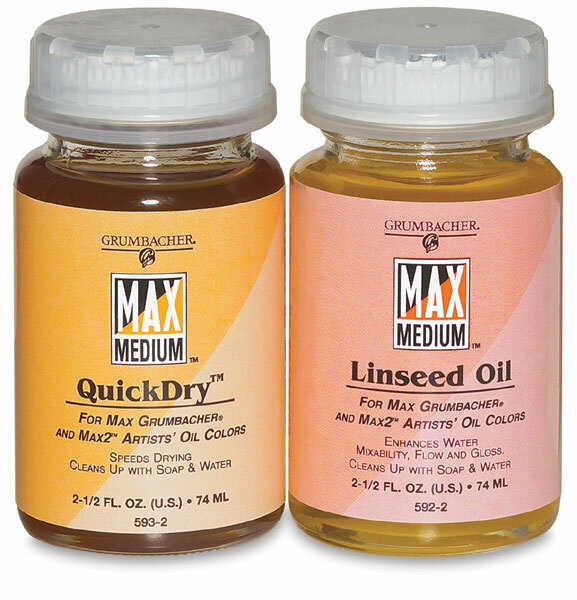 Grumbacher Max Water-Miscible Artist Oil Paint is made from the same pigments and linseed oil as Grumbacher Pre-Tested Oils, and they have comparable drying time. Max Grumbacher colors can be intermixed with any other oil colors or oil painting mediums, and they can be varnished after just 6 months. Learn more and get some tips as to best ways to work with Max paint.